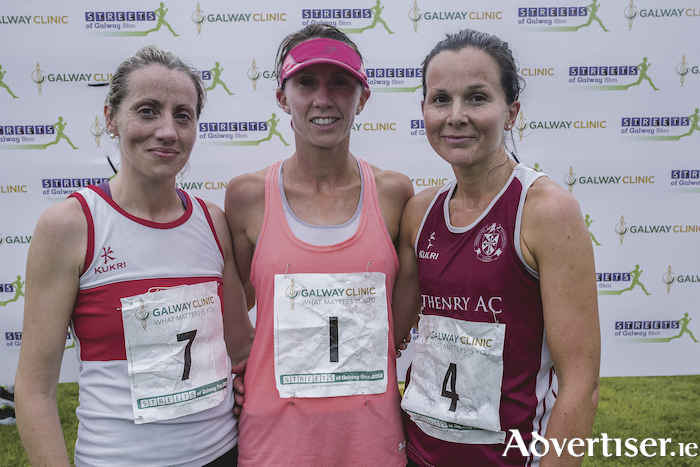 First three ladies, left to right, Regina Casey of Gch second, winner Siobhan o Doherty of Borrisokane AC, and third Jane Ann Meehan of Athenry AC. John Travers of Donore Harriers won the 33rd edition of the famous Streets of Galway 8k Road Race held on Saturday evening with a superb front running performance, befitting his national champion status. Travers, Irish international and national 1500m champion, took off in the first kilometre from the lead pack, and established an early lead which he never relinquished. Winning in a time of 23.56, he won his first Streets' victory , and was followed across the finish tape by Damien Landers and Rory Chesser of Ennis Track AC in a tight battle for the podium places, finishing in 24.29 and 24.35 respectively. The first Galway athlete over the line was Brendan McDonnell of GCH in fourth with a good run in 24.43, ahead of fifth placed Andrew Annett of North Belfast Harriers who ran 24.48. Ennis Track took the men’s team prize for the second year running, with GCH in second. In the women's section, Irish international Siobhan O'Doherty of Borrisokane AC stormed home to an incredible third title, clocking 27.50 for a well-deserved victory for the Tipperary native, O'Doherty finished ahead of top local athletes Regina Casey GCH in second with a personal best 28.38, and Jane Ann Meehan of Athenry AC who came home in 29.55. Rounding out the top five were Margaret Murphy of Mallow AC, and Emma Grimes of GCH. GCH also took the women's team title, ahead of Crusaders AC second. A record number of runners finished the race in a field which saw thousands of Galwegians and many tourists and visitors from Irish and British athletics clubs take to the city streets to run this iconic event, once again sponsored by the Galway Clinic. Squads from Galway City Harriers and Galway club compete in the National Track and Field League final which will be held in Tullamore on Sunday. The league is a team based event and Galway City Harriers men’s team under Cliff Jennings will be aiming for a podium finish in the premier division, spurred on by Sean Breathnach in the field, and Cillin Greene in the sprints. Likewise, the Galway Ladies will also be aiming high. Sarah Finnegan’s charges feature athletes from GCH, Craughwell and other county clubs, such as walker Maeve Curley of Craughwell, Sinead Treacy of Craughwell, Nicole Walsh of GCH on the track, and Emma O Hara of GCH in the field. The Galway men's team will have the task of trying to secure promotion from division one. Under managers Sean McDermott and Michael Tobin, the team features athletes from Craughwell, Castlegar, and Tuam AC clubs. Thomas Klimas won the 100 mile race in Connemara held on Saturday, winning in 15 hours 48 minutes, with Andrew Darcy second and Rex Brillantes third. The first woman home was Nicola Duffy. Caltra 5k will be held tomorrow, and will incorporate the Galway AAI 5k Road Race Championships. All Galway clubs are encouraged to have teams of women and men competing in this event. Registration is on the day from 6pm at the Caltra Community Centre or at: [email protected] start is at 7.30pm. Many of Galway’s top Masters athletes will compete at the National Masters Track and Field Championships in Tullamore on Saturday, including Ian Egan of Tuam, and Martin McEvilly, Majella Loftus and Sonya King of GCH.